Well, what do you know. 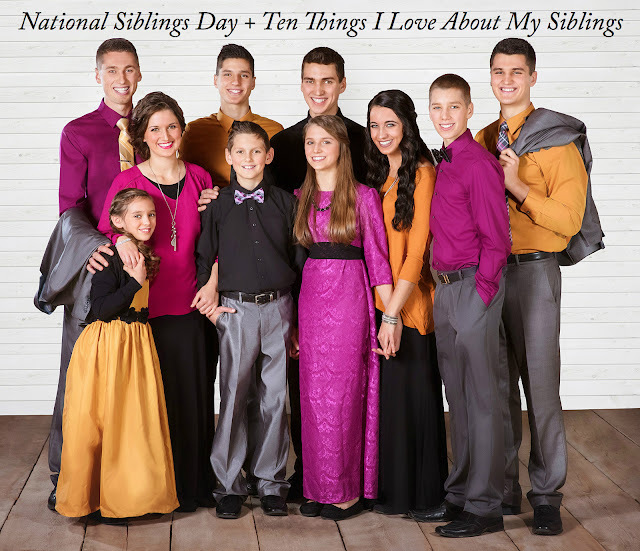 It's National Siblings Day! I don't much buy into the whole "national day of whatever" deals, as I've mentioned before, buuut...siblings are worth celebrating! Mine, in particular, are VERY worth celebrating. To the extent that I decided to do a blog post about it. These kids are the coolest I've ever met and there's no family I would rather be in than this one. We have the grandest party with whatever we're doing and some days I just have to pinch myself thinking, "Is this really my life?! Like HOW am I so extremely blessed with all this love?" Perfect? Goodness, NO NO NO. But blessed? Ah, yes, a resounding YES. I really could go on and on. But for sake of time and things like that, I will keep it short + sweet. Since today is the 10th of the month, I'm gonna give y'all ten things that I love about these siblings of mine, in the order I think of the things. 1. Their love for Jesus. I'm realizing more and more how rare it is to have ALL one's siblings love Jesus with all their hearts. Feeling convicted even now that I need to spend more time praising Jesus for that one, because it is a very special blessing! 2. Their love of laughter. Not much to say about that, except that its grand and I'm really thankful for it because it makes life so much more fun when everyone is able to smile + laugh lots! 4. Their amazing work ethics. There isn't a lazy one in the bunch, and they all pull their share of the load. It's a privilege to do life with people like that, who are all willing to work hard and give every project 100%. I am convicted, so often, by my siblings' sensitivity to truth and the Holy Spirit's working in their lives. I want to be more like them.They would honestly give the shirt off their backs, every one of them, to help someone in need. They are different as night and day, some of them, in the way they see and do life. But they are just fine with being "themselves", and recognizing the different strengths and weaknesses of different personalities, and seeing the beauty that comes when there are all four types in the world, and in families. This is particularly the older ones, although I'm pretty confidant that the "babies" will be following in their steps. They are constantly researching + brainstorming about new business ventures, or improving the ones they are already involved in. This love for excellence + growth in practical areas is so inspiring to me. 9. Their vision for life. When you have two visionaries for parents, I guess this one might not really be an option. But still. Visionary action, at least, is a decision. The thinking might be more personality. But anyone can be a dreamer, and the dreams can stay right there, in the mind. It takes grit + determination to make those dreams happen. I've seen that determination in my siblings, even the little ones, and it blesses my heart so much. 10. Their passion for the Word. This is a heritage that has been passed down for from my grandparents, to my parents, now to my siblings. The younger ones have especially cultivated a deep knowledge of the Word, through the Bible Bee. I wish sometimes I could do my pre-teen/teenage years over and memorize as much as they have! But even aside from memory, my siblings are so committed to making God's Word a regular part of their daily life, and I am grateful for that about them. My siblings would be the first to tell you that they aren't perfect. They have misunderstandings, and disagreements, and plenty of opportunities for needing to ask forgiveness. But they are gems, each and every one of them, and I love them to pieces. No one else I'd rather have been with for the past twenty-six years of life. And even with the many current changes in our family, I am confidant that this sibling closeness will stand the test of time, and that we'll be just as great of friends in fifty years, when we are all old and grey, as we are now. to the sweetest tribe I know! How'd you get the nickname Willie? Love this, Chels!!! So sweet! I have been so blessed by observing your family, in person and on the blog, and seeing how strong a relationship you all have with each other!! This is such a blessing! I am thankful for my siblings. :) What a fun holiday! Amen to number one! It really is an incredible blessing to have siblings who love the Lord. This is so sweet! You, Chels, are the bestest leader of our sibling tribe!!! God was so wise to place you first to blaze the trail and lead our adventures! I love you, dear, and this post was fabulous. Just curious, how did you get Willie as a nickname? Hi, Chelsy! Love the post and the nicknames! How do you come up with them? I can't find any good ones for my siblings! And does Taylor's nickname come from his middle name after Willie Lincoln? It would make sense! I am so glad to see a family who loves each other! Many families today dislike hanging out together and I think spending time as a whole fixes that. Your family definitely spends tons of time together and as a result, are the kindest people ever! We came up with them quite randomly. Some have stories behind them, some are simply a shortening of the original name. See my answer, as to his nickname, above! Hello! G8 post! I'd luv 2 hear the stories behind some of your nicknames! Hey! I just wanted to ask one quick question about your brother. (By the way, all your siblings + you are great and I can see Jesus shine through all of you!) At your family website, I just noticed while reading about each awesome person, that Taylor's middle name was listed first. I am probably mistaken and sorry to disturb you with my pesky questions! 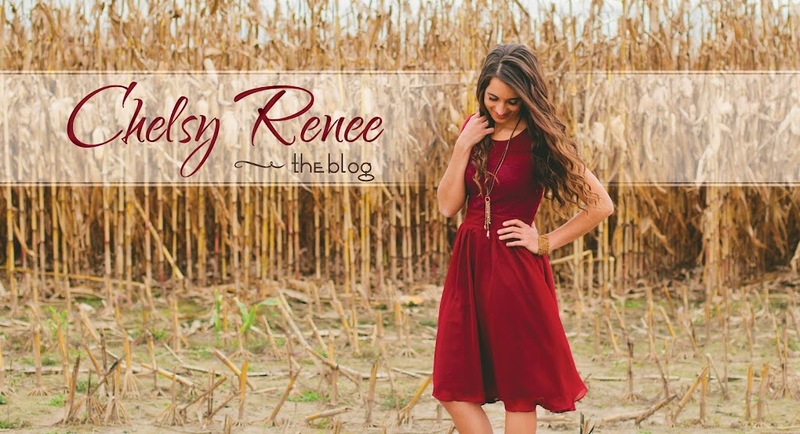 Keep up the fantastic job and great post, Chelsy! No worries! So Taylor's first name is actually Lincoln. Taylor is his middle name. My parents like the flow of "Lincoln Taylor" better than "Taylor Lincoln", but they wanted to actually call him Taylor. That's how his name came about to be that way. Thanks for answering. I know sometimes nicknames can be personal. Fortunately, in my family, I have no nicknames because none stick, but my siblings haven't been so lucky. And I never would've guessed that Taylor's first name was Lincoln! When I met him, he introduced himself as Taylor, so I had no doubt that he wasn't. I never have heard of William Wallace, is he a Christian? Well, thanks again and have a blessed Wednesday! William Wallace was a Scottish knight, born in 1270. He was one of the main leaders who spearheaded the fight for freedom in Scotland. (Wars of Scottish Independence) You should study his life sometime-he was a fascinating man! And yes, he was a Christian. Great post!! I didn't even know there was a national sibling day until I saw this post.. Next year I'll have to do something special with my siblings! By the way how did you guys get those nicknames? Yes, I too have wondered if Taylor's real name is Lincoln Taylor, but it isn't is it? Because your family refers to him as Taylor, I know because I have seen and heard. But does he prefer to go by Taylor?